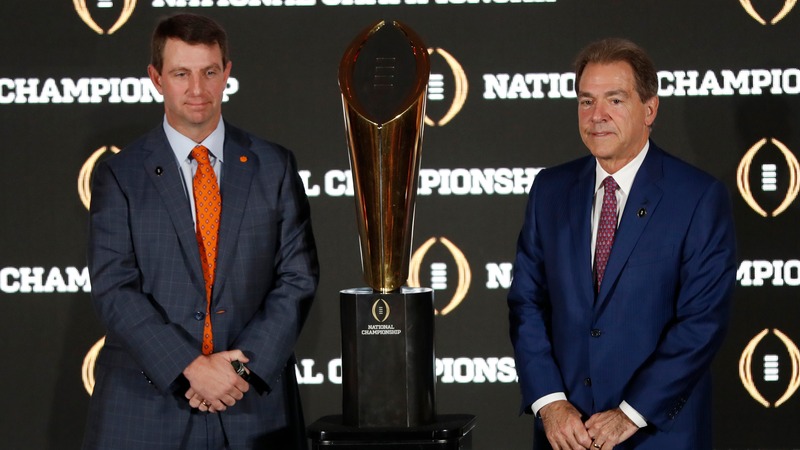 Bookmakers have a difference in opinion with their College Football Playoff National Championship odds for a potential Alabama vs. Clemson matchup. The College Football Playoff semifinals aren't over yet, but with Alabama leading Oklahoma 31-10 at halftime, oddsmakers are willing to risk putting out their College Football Playoff National Championship odds in an effort to entice action while interest is high. However, there does appear to be some difference in opinion because of the levels of dominance by both Clemson and Alabama. The Tigers blew out Notre Dame at the Cotton Bowl, with true freshman quarterback Trevor Lawrence throwing for 342 yards with three scores and the Clemson defensive line owning the line of scrimmage on the way to a 30-3 win. After a late run on Notre Dame drove the line down to Clemson -10.5, the win cemented that the Tigers are one of the two best teams in the country. __Play to win:__ [Enter our free contests to win great prizes like Bears playoff tickets and even cash! ](https://betchicago.chalkline.com/) However, Alabama was also dominant after closing as a 14.5-point favorite in the Orange Bowl against Oklahoma. The Crimson Tide raced out to a 28-0 lead and that's when we started seeing odds posted by bookmakers. BetOnline opened with Alabama as a nine-point favorite but that number was [almost immediately](https://twitter.com/DaveMasonBOL/status/1079197118248771585) bet down to eight. And as Oklahoma scratched their way back into the game, several other books came out with lines favoring Alabama against Clemson by between 5.5 and 6.5. William Hill U.S. [made](https://twitter.com/SportsLine/status/1079200192778387456) Alabama a 5.5-point favorite after lookahead lines had them at six. At CG Technology, the Crimson Tide were favored [by six. ](https://twitter.com/jsimbal/status/1079209168928526336) Then at Westgate, Alabama was a 6.5-point favorite with the total at 57.5. Ultimately, both teams will face questions about the legitimacy of their opponents. Notre Dame benefitted from a schedule that wound up being weaker than expected and Oklahoma's defense was awful all season, while Georgia proved that they could put up a fight in the SEC Championship against Alabama and Ohio State may also be a better matchup for Alabama or Clemson from a talent standpoint. __More:__ [College Football Playoff betting recap](https://www.betchicago.com/college-football-playoff-betting-recap-clemson-alabama) However, these were the two clear-cut favorites all season long and the lines reflect that. No other team in the nation would be less than a two-score underdog against Alabama, yet Clemson is getting just one score. It will be interesting to see if more of a consensus forms on College Football Playoff National Championship odds over the course of the next week or if the finish to Alabama vs. Oklahoma might influence the action in any way. Either way, it should be a great championship game.